Extinguish or prevent problems? Reply’s Laboratory enables companies to automate the testing of their critical business applications. Reply’s new Centre is focused on the automated monitoring and testing of the quality of your products and services. Reply’s Centre offers you the opportunity to optimise the costs and speed-to-market of your business. Reply’s Centre is the solution that enables you to identify risks and plan corrective actions in order to prevent problems relating to your IT systems and applications. Reply’s Centre has the right tools to measure and improve the quality of the experience perceived by end users. Speed-to-market and the quality of products and services are differentiating factors in a market environment that is increasingly more competitive and technologically complex. For today’s companies, Test Automation is no longer an option, but a necessity. Concept Reply has designed an effective Test Automation solution that is scalable and flexible, based on a technological and methodological Framework. The new Global Test Automation Centre enables customers to monitor the quality of their products and services both during development and after the commercial launch. The Global Test Automation Centre provides different types of users, from business to marketing and technical users, with valuable tools designed to monitor the maturity of a product or service during its life cycle, from development to use. Through years of experience and research, Concept Reply has developed a methodological Framework that facilitates the integration of Test Automation in the business processes of companies, simplifying its adoption. For today’s companies, Quality Assurance Process Automation is no longer an option, but a necessity. To meet this market need, Concept Reply inaugurates the Global Test Automation Centre, that enables customers to monitor the quality of products or services on an ongoing basis, throughout their life cycle. Our "As a service" model is based on a "flat service fee" that allows you to monitor the quality of products and services without having to buy a specific Test Automation solution. We take care of identifying the best solution within our Framework, according to the development process in use (waterfall, Agile or DevOps) and constantly providing you with the quality indicators that best suit your business. Do you need to instantiate your Test Automation solution only when necessary? Our Global Test Automation Center is available to you in "pay-per-use" mode and allows you to manage global testing activities. Do you need an "ad-hoc" solution to automate testing activities? We can support to identify and the best solution and fully exploit the potential of our Framework through a "set-up fee". Then you will assess whether to adopt the "flat fee" service model and constantly monitor quality. As a center of expertise and excellence on Test Automation we can provide you with consulting services relating to the better testing strategy in order to obtain an adequate return on your investment. The adoption of Agile/DevOps methodologies dramatically reduces development time and supports the concept of "immediately available". As a faster and more efficient answer to customer needs and business transformation, the adoption of Agile/DevOps methodologies allows switching from long release cycles to weekly or daily releases. In this new scenario, Reply's Quality Monitoring services use Continuous Testing processes that, through an incremental development of automatic test suites, allow constant monitoring of quality and guarantee a continuous flow of reliable releases into production. Moreover, the use of Agile techniques for planning processes (Agile pipeline), allows to define and map the requirements to be issued to each Sprint by classifying the related effort with the Story Points with continuous monitoring of the performances through the BurnDown Charts, thus guaranteeing their quick release. It is also possible to revise the requirements without significant impacts on the entire project by means of a constant activity of Backlog Refinement. The use of the integrated DevOps methodology allows the Reply service to control and monitor quality in the development, testing and distribution phases, thus creating a continuous stream of production releases. Ad-hoc DevOps tools such as Jenkins, CVS (Concurrent Versioning System) and GitHub allow our Service to correctly manage the Build Management), Release Management, Deployment Automation and Test Orchestration. Are customers reporting problems relating to the use of your IT systems and applications? Ask our team of specialists to intervene quickly to control the emergency and resolve your immediate problems. Subsequently, we will help you understand the root causes behind your problems and improve the perception of your brand. WE PROVIDE SUPPORT DURING THE MOST CRITICAL PERIODS! “Prevention is better than cure” ... and helps you reduce costs! Our Framework enables you to monitor the quality of your products or services on an ongoing basis, throughout their life cycle. You can thus anticipate potential problems, implement corrective actions, avoid negative impacts on end customers and reduce future costs. THE SOLUTION IS “SERVICE-FOCUSED” ... AND TAILORED TO YOUR NEEDS! Adopt the best testing strategy for your business. Monitor the quality and maturity of a product or service. Evaluate the risks and make decisions based on the data analysed. In the Automotive sector, the use of electronics and on-board software is experiencing exponential growth: electronic control units have seen a dramatic increase, cars are more and more connected among each other and with the outside world, new telematics solutions are being continuously introduced on the market and autonomous driving is becoming a reality. In this context, Concept Reply plays a crucial role in the Automotive Validation field, both with regard to car/truck makers and to OEM companies, and is able to provide support for the validation of Infotainment and Navigation, Board Telematics, Body Computers and Instrumental Panel Cluster systems, as well as for their integration at the car and/or truck system level. In the current context of continuous digital transformation, which sees the multiplication of touch points that companies can provide to their customers, it is crucial to safeguard constantly the quality of the brand perceived by end users of the services and products offered. Moreover, it should also be taken into consideration that the customer experience can be disseminated in real-time, for example through channels such as forums, blogs, social networks and app stores. In this challenging scenario, Concept Reply offers its services as a technology partner to support eCommerce companies in their Quality Review and Brand Perception processes, during the online product purchase experience. This is achieved by offering sales platform validation services and measurement tools that reproduce the end-to-end user experience and are designed to help enterprises reach and maintain an excellent standard of quality and sentiment perceived by end users. In the banking and insurance sectors, companies are increasingly aiming to offer their own business services, complementing over-the-counter services with the use of applications and websites designed to guarantee end users quick, immediate and independent access to manage their finances. In the process of digital evolution and transformation, ranging from the strategic selection of the technological context, to the validation of the services offered on the most common devices, Concept Reply has already actively partnered and continues to support leading European banking and insurance institutions based on targeted market analysis (browsers, smartphones, tablets, smart watches), with the goal of maintaining a high level of quality perception with respect to the technological evolution of the devices. The process of convergence between Telecommunications and Media requires a particular focus on components for high value-added services. The Telco & Media domain is dominated by a growing number of networked devices and is becoming increasingly more complex. In this sector innovation is an everyday challenge and guaranteeing an adequate Customer Experience to end users becomes a key success factor. 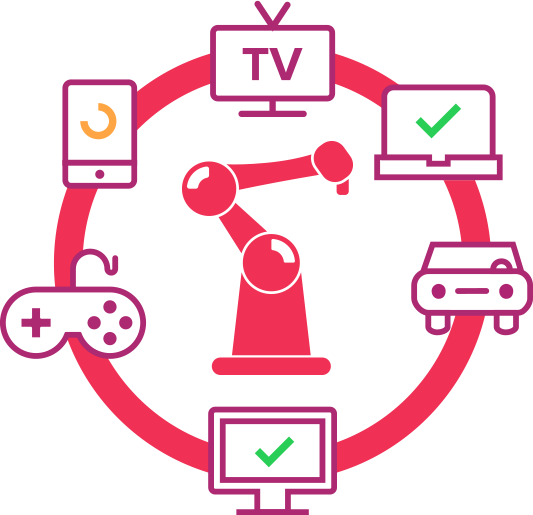 Concept Reply’s extensive experience, gained in Field Testing, System Testing, Network Testing, Acceptance Testing and Customer Experience, allows it to provide consulting and acceptance services to Network Operators, OTT (Over-The-Top) companies and Media and Electronics Manufacturers designed to support the end-to-end validation of Devices, Networks, Services and Applications. In addition to the Global Test Automation Centre, Reply also offers various laboratories of excellence designed to support product development in compliance with the highest standards of quality. Click and discover the full potential of our Labs! Wireless communication devices are becoming increasingly more common in the environments in which we live and work. To communicate, these devices rely on a range of technologies (Bluetooth, WLAN, 3G, UMTS, etc.) that provide for the transmission and reception of energy in space. The optimisation of this transmission is critical for ensuring good communication. In addition to verifying that a product meets the specifications for which it was designed (validation), it is important to be able to predict how the same product will adhere to these specifications during its operational life (namely, verifying its reliability). Despite being used to exchanging large amounts of digital data, voice communication continues to be of primary importance and is used daily in the various environments in which we find ourselves: home, office, car. It is therefore important to ensure that the relative quality, both objective and perceived, is of the highest level. Many of the devices with which we deal on a daily basis have the ability to take still pictures or videos. Smartphones, tablets, computers and even cars are equipped with image sensors (cameras), whose performance must be validated and optimised to the specific area of use. In a market invaded by different and increasingly more connected objects, in which the customer is able to access the various services from different devices, it is essential to guarantee quality through all digital channels, thus preserving the perception of the brand. Concept Reply is the Reply Group company specialised in the research, development and validation of innovative solutions in the IoT (Internet of Things) field. Today, Concept Reply is also recognised by the market as a centre of expertise and excellence in Testing and Quality Assurance and includes a Business Unit specialised in this type of service. Concept Reply was established in 2009 following the acquisition, by the Reply Group, of Motorola's Research and Development Centre in Turin. Thanks to its laboratories and to an international team of professionals specialising in the QA and Validation fields, Concept Reply is able to provide companies with an end-to-end support for the validation of products and services, while at the same time optimising costs and time-to-market.